ROW ROW FIGHT THE POWER! One thing I noticed, this really seems to be more of a Sakuya route than a Chihaya one. From early on in the common route branch the concept of self-sacrifice is introduced with Sakuya protecting Chihaya from a falling pot with his body, and then lying about placing it there earlier. Sakuya asks Kotarou if he would be willing to risk his life to save another, and when given the choice you can only answer “No” or “I don’t know”. Kotarou really can’t come to terms with sacrifice that early, but I’m guessing No is a dead-end choice, because it eventually leads to him resolving to protect Chihaya with his life. It’s a bit ironic though, because early on we’re shown that Chihaya is probably the person least in need of protecting. Together with Sakuya, she’s one of the most powerful forces in the world. But this is illustrated a number of times when Kotarou feels like he’s a third wheel in his relationship with Chihaya, until he realizes that he feels for her differently than Sakuya does. Kotarou gets wrapped up in the war between the two factions, and we get to learn a whole lot more about the politics of it all. The details are still skimmed over though, because Chihaya isn’t that involved, she kinda just does what she’s told. Following the path of her parents, she never questioned not being a summoner of Gaia. She never questioned why she fought, she was just a weapon for Gaia. In the beginning Kotarou believed she had a very free life, but it turns out to be the opposite. A strange lack of freedom where the imprisoned doesn’t even realize they’re imprisoned, and thus makes no attempts to break free. Now I’m wondering if that’s even really imprisonment at all… At any rate, Kotarou definitely questions it. When learning about Gaia’s plans and motivations, he can’t say he agrees with any of it, but chooses to join them anyway. Why does Kotarou fight? In the beginning, Kotarou just wanted to return to how things used to be, with everyone getting along in the Occult Club. He wanted to change the world, so that the Occult Club could come back together, to preserve their everyday life. But after a while, Kotarou wondered if this was okay. He was caught up in a war being fought to determine the fate of the world, and he just wanted to be with his friends. Are his actions too selfish? Chihaya may not really be one of them, but there are people like Akane, Shizuru and Lucia which are fighting over what they believe is best for the world, giving their life for it. All Kotarou wants is to be with his friends. After a while though, Kotarou does gain a secondary objective: to protect Chihaya. But he’s powerless, so he seeks power to protect these things. However, to accomplish these goals he insists that he doesn’t resort to killing anybody. Midou is a great plot device in serving to highlight everything Kotarou doesn’t want to be. Midou’s words to live by are “kill or be killed”, every aspect of his character screams this. He holds a deep resentment for the world, a world that supposedly broke him to become the maniac he is now. To live, he is forced to kill, and he lets killing become his life, until he is eventually killed himself. Kotarou empathises with Midou, stating that he could’ve become the same person if things in his life went differently. Somehow, Midou seems driven to corrupt Kotarou into becoming like him. Perhaps he despises Kotarou for the life he has, a kind of jealousy. Even after committing suicide in front of Kotarou after their battle, he continues influencing him from beyond the grave. Not sure if that’s some kind of psychological scarring or if he was actually being haunted by Midou, but I won’t look into that too much. Again and again, Kotarou is challenged with scenarios that pressure him to kill in order to get what he wants. Kill to survive, kill to protect. Midou’s presence keeps pushing Kotarou to make that choice, to become as he was. But that’s not the only problem. Killing is one problem he faces, but another is power itself. Throughout the story Kotarou keeps getting stronger and stronger, through the help of Sakuya’s training and his own rewriting. He really wants to be of use to Chihaya, to become strong enough that he can fight alongside her, and maybe even protect her. There was a LOT of rewriting in this route. I’m pretty convinced that if I chose to use my rewriting power at any point in the common route, I wouldn’t survive the rewriting in Chihaya’s route. Thankfully I didn’t, and by the end I managed to keep ‘that’ from happening. There were so many amazing action scenes in this route, one of the most notable being the battle against Krivoy Rog. At each moment I really felt like I was an inch from death, and it presented me with quite a few life or death choices during the battle. Unfortunately I ended up choosing the wrong choice more often than not. But there was one choice toward the end of the battle that I knew wouldn’t end well, but I was too curious to see what would happen. 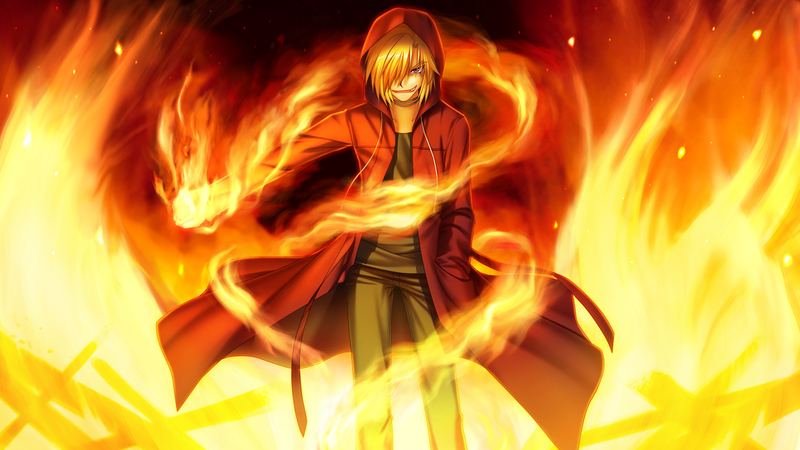 Of course, I’m talking about the choice to strengthen Kotarou’s aurora. Making that choice, I finally saw those warnings confirmed as Kotarou, in the process of strengthening his aurora, rewrote his mind, and turned berserk. The screen goes dark, with Kotarou wondering what happened after that. It’s shown much more clearly in the scene in the chapel. Kotarou is powerless at the hands of his enemies, unable to protect Chihaya. Midou provokes him to rewrite himself and become strong enough to kill these people, and surrenders to his desire, going berserk. The perspective switches to Chihaya as Kotarou loses control and starts aggressively attacking everyone, motivated by the single emotion of wanting to protect Chihaya. Unable to distinguish friend from foe, he starts fighting Sakuya with all his strength. A part him that’s still conscious realizes that deep down he wants to fight Sakuya, because he wants to be the one to protect Chihaya. Jealous of Sakuya’s skill and power, he fights. 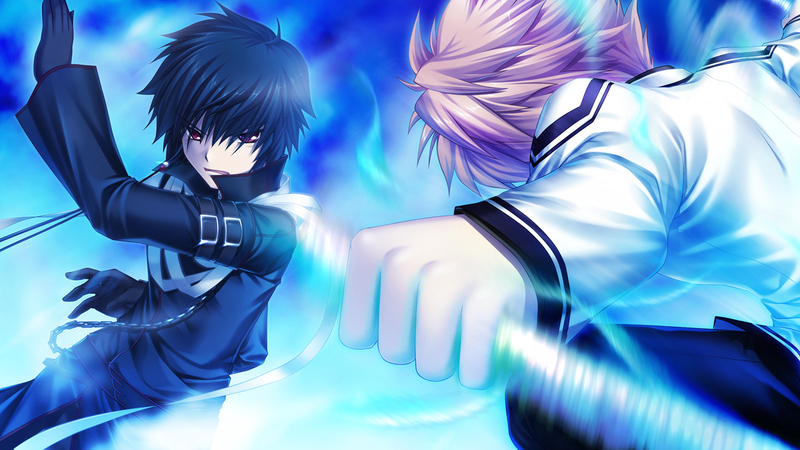 Sakuya had already realized that he was Kotarou’s predecessor, but because of that, he had to win against Kotarou. Either through some kind of unexplained phenomena, or more likely perhaps through Sakuya’s own rewriting power, he was able to rewrite Kotarou back to his former self. This is really where all of Kotarou’s challenges are highlighted. At this point his primary objective is to protect Chihaya because he loves her, but he doesn’t want to kill anybody and he doesn’t want to lose himself to his rewriting power. And even now he still can’t accept the meaning of sacrifice. Even now he still wants to bring the occult club back together, further strengthening his pacifism, not wanting to fight Lucia or Shizuru. Kotarou has a lot to deal with. After being rewritten back to his old self, he sees into Sakuya’s memories, about how Sakuya was once a human who fought in this same war a very long time ago, and failed to protect a girl and prevent salvation. He survived salvation and became a familiar which ended up forming a contract with Chihaya, vowing to protect her to atone for his failure. In the next battle against Akane’s familiars, Sakuya uses what power he has left to defeat them, sacrificing himself to protect Chihaya. And not long after Pani and Gil sacrifice themselves for Chihaya and Kotarou as well. Talking with Gil, Kotarou is confronted by his ideals. About not wanting to kill, and about fighting to keep everyone happy despite the odds, and about the meaning of sacrifice. He wonders if he should stop living this way and start being an adult. But despite everything, Gil still encourages Kotarou, saying that he should continue living as he has up until now, fighting for his crazy ideals. Kotarou is still angry and sad about people sacrificing themselves for him, but perhaps he has begun to accept it. The final battle begins, and it looks as though the only options left are to wipe out most of humanity to save the world, or for Chihaya to keep injuring herself over and over until Sakuya’s energy depletes. Everyone sinks into despair, and Kotarou is unable to accept this ending. So, he decides to continue fighting for his ideals, despite the odds. In Shizuru’s words, “Kotarou fights for the simplest, most ideal solutions.” At this point the scene feels like something out of Toaru Majutsu no Index, with Kotarou mounting a sword flying toward the giant, chopping up it’s vines with his aurora. 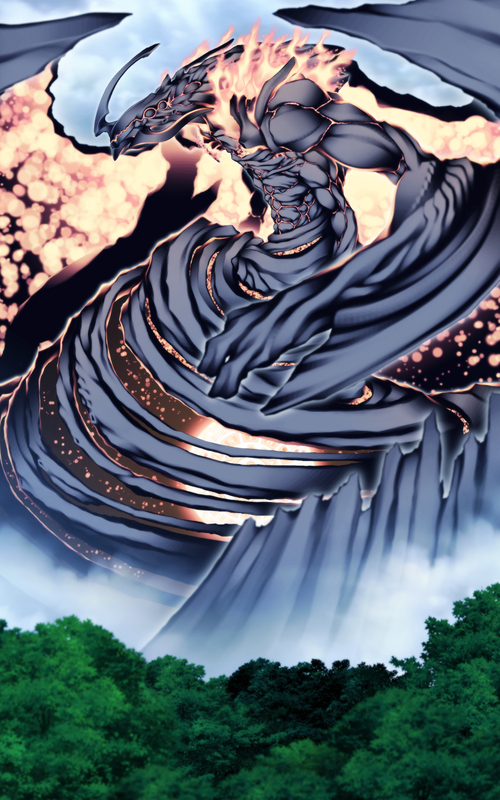 He is stopped by a bigger vine, which he then slices through with an aurora empowered with Fuego’s flames, and finished the battle with a lunge toward the heart of the giant, giving Sakuya a nice big punch. ROW ROW FIGHT THE POWER. Sakuya’s final moments end with a battle with Kotarou, with Kotarou winning and fulfilling his role as Chihaya’s new guardian. And at the very end, Kotarou was able to bring at least half of the original Occult club back together, just like he’d been fighting for. And the final scene closes with the strong implication that Chihaya was able to bring Sakuya back. A very happy ending here. There was a fair share of drama in this route, but it never felt as intense or dark as Kotori’s route had been. In Kotori’s route, you were completely powerless about everything. In this route however, you may have felt powerless at times, but Kotarou got the power he needed. He kept on fighting for the best possible outcome, and he pretty much got it. This route is comparatively fluffy compared to Kotori’s route. Not to say that’s a bad thing, it was refreshing to get such a different taste from the second route. They were just so different! This was the empowering route, with heaps of amazing action scenes that Kotarou just barely gets through each time. A bit of a thriller. Maybe it was a bit cheesy at times, but damn it was nice to watch. 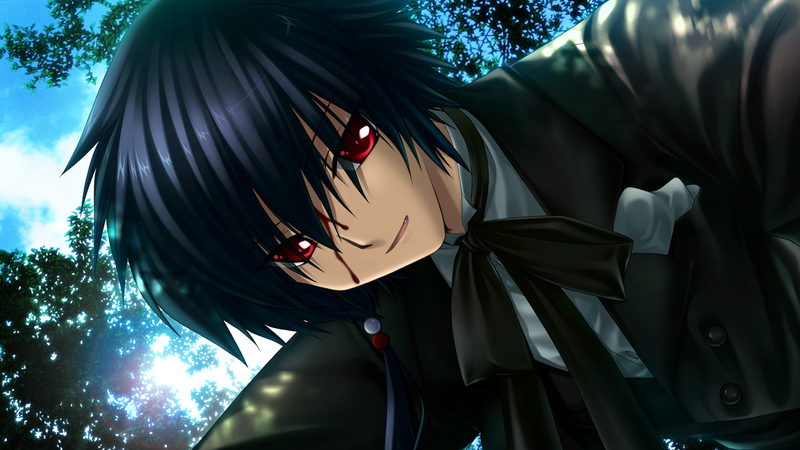 I’m not sure if the other routes can top this level of epic though, guess I’ll have to wait and see. If anything, from this I’ve come to expect that each route will offer something different. 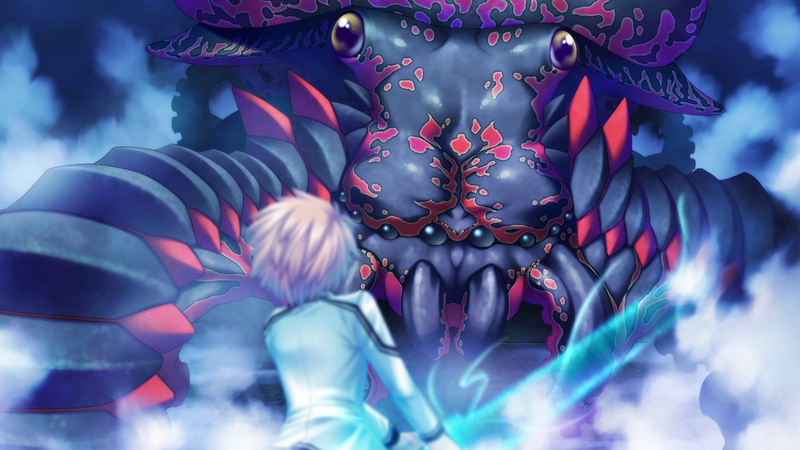 I still retain my opinion that Rewrite doesn’t feel like a Key game. Everything about it is so different from their other works. But I love it, oh I love it. I don’t know if I’d recommend this to people who love Key games, but I’d still recommend it on the grounds of it being an amazing visual novel. You came out of your shell to try something different Key, and so far it’s paid off brilliantly. Before I go, I’m gonna end this post with a wild mass guess. ‘Salvation’ involves sending the world back in time, aka Rewriting it. Australian J-geek with a passion for Gaming and Writing. Psychology student, Nintendo/Key/Ryukishi07 fan. 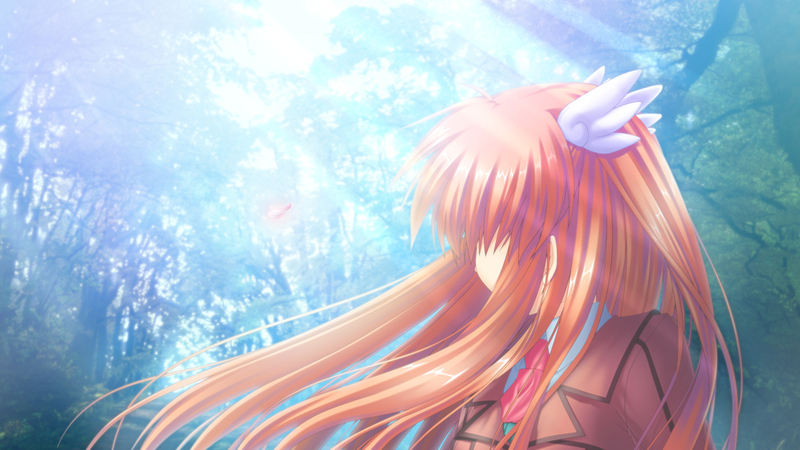 This entry was posted in Reflection and tagged Key, Rewrite, Visual Novel. Bookmark the permalink. I managed to survive this route, despite the actual tonne of rewriting I did in the common route, it was really close of course.